Graduation in Chemical Engineering, Instituto Superior Técnico (1986). PhD., Instituto Superior Técnico (J. A. Martinho Simões, A. Romão Dias, 1993). After finishing his PhD Hermínio Pires Diogo became Membro Integrado of Centro de Química Estrutural, in the group of Organometallic Chemistry and Homogeneous Catalysis. His research interests are divided in two areas: (a) thermochemical studies of organic and organometallic compounds mainly in the energetic-structure-reactivity relationship; (b) calorimetric and dielectric studies on amorphous materials. In the area of organic species the main aim of his research is directed to the determination of enthalpies of formation in condensed, solution and, when possible, gaseous phases of low molecular compounds containing C, H, O, N, namely carbohydrates, polycyclic aromatic hydrocarbons (PAH) and, recently, molecules with pharmaceutical significance. The central calorimetric techniques used are: macro and micro combustion calorimetry, reaction-solution calorimetry, and Knudsen effusion method. The values of enthalpies of formation are essential values for the optimization of energetic balances and reactions pathways, development of estimated methods, and computational chemistry methods. In the field of organometallic thermochemistry, the main studies are focused on the trends of bond dissociation energies in M(5-C5H5)2Ln complexes (M= transition metal; L= halogen, alkyl, aryl, alkoxide, etc. ; n= 1,2,3) using reaction-solution calorimetry and the Knudsen effusion method. His scientific interests in the filed of glass formers materials, like carbohydrates and molecules with relevance on the pharmaceutical area, are mainly centred on the slow molecular mobility process associated with both glass and sub-glass transition by using the dielectric technique of Thermally Stimulated Currents. Studies on polymorphism of organic solids are also another area of his activity. Graduation on Chemical Engineering, Instituto Superior Técnico (1986). PhD. on Chemical Engineeering, Instituto Superior Técnico (J. A. Martinho Simões; A. Romão Dias, 1993 – Thermochemistry of Organometallic Complexes of Zirconium and Niobium of Cyclopentadienyl Type and Organic compounds Containing C, H, O, N.
Post-Doc, Department of Chemistry, University of Oslo, Norway. (1996). 1988 - 1990 – Junior Teaching Assistant, Departamento de Engenharia Química, Instituto Superior de Engenharia de Lisboa. 1990 - 1991 – Junior Teaching Assistant, Departamento de Engenharia Química, Instituto Superior Técnico. 1991 - 1993 – Teaching Assistant, Departamento de Engenharia Química, Instituto Superior Técnico. 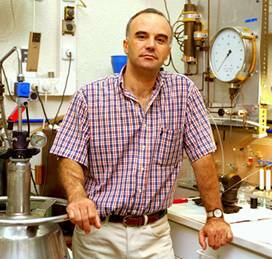 1993 - Assistant Professor, Departamento de Engenharia Química, Instituto Superior Técnico. He was responsible for the discipline of General Chemistry Laboratory -II (before Bolonha) for the graduations in Chemical Engineering, Biological Engineering and Chemistry. Presently he is in charge of Chemistry Laboratory - II (after Bolonha) for the graduations in Chemical Engineering and Biological Engineering. A. R. Dias, P. B. Dias, H. P. Diogo, A. M. Galvão, M. E. Minas da Piedade, J. A. Martinho Simões, Energetics of Molybdenum-Azobenzene, Titanium-Azobenzene Titanium-Iodide, and Titanium-Carbonyl Bonds in Bis(cyclopentadienyl) Complexes, Organometallics, 1987, 6, 1427. Dias, A.R., Diogo, H.P., Griller, D., Minas da Piedade, M. E., Martinho Simões J.A., Metal-Carbon and Metal-Hydrogen Bond Dissociation Enthalpies from Classical and Non-Classical Calorimetric Studies. American Chemical Society Symposium Series No. 428, Bonding Energetics in Organometallic Compounds (T.J. Marks, Editor), 1990. Diogo, H.P., Dias, A.R., Dhalla, A., Minas da Piedade, M.E., Begley, T.P. Mechanistic Studies on DNA Photolyase 4. The Enthalpy of Cleavage of a Model Photodimer, Journal of Organic Chemistry, 56, 7340, 1991. Diogo, H.P., Simoni, J.A., Minas da Piedade, M.E., Dias, A.R., Martinho Simões, J.A. Thermochemistry of Zirconium and Niobium Organometallic Compounds, Journal of the American Chemical Society, 115, 2764, 1993. Diogo, H.P., Minas da Piedade, M.E., Dennis, T.J.S., Hare, J.P., Kroto, H.W., Taylor, R., Walton, D.R.M. Enthalpies of Formation of Buckminsterfullerene (C60) and of the Parent Ions C60+, C602+, C603+, and C60-, Journal of Chemical Society, Faraday Transactions, 89, 3541, 1993. H. P. Diogo, M. E. Minas da Piedade, A. C. Fernandes, J. A. Martinho Simões, M. A. V. Ribeiro da Silva, M. J. S. Monte, The Enthalpy of Sublimation of Diphenylacetylene from Knudsen Effusion Studies, Thermochimica Acta, 1993, 228, 15. H. P. Diogo, M. E. Minas da Piedade, A Micro-Combustion Calorimeter Suitable for Samples of Mass 10 mg to 50 mg. Application to Solid Compounds of C, H, and O, and of C, H, O, and N, Journal of Chemical Thermodynamics , 1995, 27, 197. H. P. Diogo, G. Persy, M. E. Minas da Piedade, J. Wirz, The Enthalpy of Formation of Pyracylene, Journal of Organic Chemistry 1996, 61, 6733. H. P. Diogo, M. E. Minas da Piedade , Enthalpies of Formation of C60 and C70 in the Crystalline State: An Unfinished Tale?, Recent Advances in the Chemistry and Physics of Fullerenes and Related Materials;. K.M. Kadish and R.S. Ruoff, Eds. ; The Electrochemical Society: New Jersey, 1998, v.6, pp. 627. R. C. Santos, H. P. Diogo, M. E. Minas da Piedade, The Determination of the Standard Molar Enthalpy of Formation of 4-Chlorobenzoic Acid by Micro Rotating-Bomb Combustion Calorimetry, Journal of Chemical Thermodynamics 1999, 31, 1. A. L. C. Lagoa, H. P. Diogo, M. P. Dias, M. E. Minas da Piedade, L. M. P. F. Amaral, M. A. V. Ribeiro da Silva, J. A. Martinho Simões, R. C. Guedes, B. J. Costa Cabral, K. Schwarz, M. Epple, Energetics of C-Cl, C-Br, and C-I Bonds in Haloacetic Acids. Enthalpies of Formation of XCH2COOH (X = Cl, Br, I) Compounds and of the Carboxymethyl Radical, Chemistry European Journal 2001, 7, 483. H. P. Diogo, M. E. Minas da Piedade, Enthalpy of Formation of Benzo[k]fluoranthene, Journal of Chemical Thermodynamics 2002, 34, 173. H. P. Diogo, T. Kiyobayashi, M. E. Minas da Piedade, N. Burlak D. W. Rogers, D. McMasters, G. Persy, J. Wirz, J. F. Liebman, The Aromaticity of Pyracylene: An Experimental and Computational Study of the Energetics of the Hydrogenation of Acenaphthylene and Pyracylene, Journal of the American Chemical Society 2002, 124, 2065. N. T. Correia, J. J. Moura Ramos, H. P. Diogo, The Orientational Glass Transition in Pentachloronitrobenzene: a Study by Differential Scanning Calorimetry and Thermally Stimulated Currents, Journal of Physics and Chemistry of Solids 2002, 63, 1717. J. J. Moura Ramos, R. Taveira-Marques, H. P. Diogo, Estimation of the Fragility Index of Indomethacin by DSC Using the Heating and Cooling Rate Dependence of the Glass Transition, Journal of Pharmaceutical Sciences 2004, 93, 1503. H. P. Diogo, S. S. Pinto, J. J. Moura Ramos, Thermodynamic and Kinetic Behaviour of Salicylsalicylic Acid: a Calorimetric Study, Journal of Thermal Analysis and Calorimetry 2004, 77, 893. J. J. Moura Ramos, H. P. Diogo, M. H. Godinho, C. Cruz, K. Merkel, Anomalous Thermal Behaviour of Salicylsalicylic Acid and Evidence for a Monotropic Transition to a Nematic Phase, Journal of Physical Chemistry B 2004, 108, 7955. H. P. Diogo, N. T. Correia, J. J. Moura Ramos, Molecular Mobility, Phase Transitions and Phase Transformations in Crystalline ortho- and meta-carboranes, Journal of Physics and Chemistry of Solids 2005, 66, 832. S. S. Pinto; H. P. Diogo; R. C. Guedes; B. J. Costa-Cabral; M. E. Minas da Piedade; J. A . Martinho Simões, Energetics of Hydroxybenzoic Acids and of the Corresponding Carboxyphenoxyl Radicals. Intramolecular Hydrogen Bonding in 2-Hydroxybenzoic Acid, Journal of Physical Chemistry A 2005, 109, 9700. H. P. Diogo, J. J. Moura Ramos, Slow Molecular Mobility in 4,4´-methylenebis(N,N-diglycidylaniline) as Studied by Thermally Stimulated Depolarization Currents (TSDC),Journal of Molecular Liquids, 2006, 129, 138. R. C. Santos; C. S. E. Bernardes; H. P. Diogo; M. F. M. Piedade; J. N. Canongia Lopes; M. E. Minas da Piedade, Energetics of Thermal Dimerization of Acenapthylene to Heptacyclene, Journal of Physical Chemistry A, 2006, 110, 2299. S. S. Pinto, H. P. Diogo, Thermochemical Study of Two Anhydrous Polymorphs of Caffeine, Journal of Chemical Thermodynamics, 2006, 38, 1515. J. J. Moura Ramos, H. P. Diogo, S. S. Pinto, Effect of Physical Aging on the Johari-Goldstein and Beta Relaxations of D-sorbitol. A Study by Thermally Stimulated Depolarisation Currents, Journal Chemical Physics 2007, 126, 144506. L. S. Richard, C. E. S. Bernardes, H. P. Diogo, J. P. Leal, M. E. Minas da Piedade, Energetics of Cresols and of Methylphenoxyl Radicals, Journal Physical Chemistry A 2007, 111, 8741. J. J. Moura Ramos, H. P. Diogo, S. S. Pinto, Local Motions in L-iditol Glass. Identifying Different Types of Secondary Relaxations, Thermochimica Acta, 2008, 467, 107.